Suppose you have two data sets (tables), oldfile and newfile. You want to compare these two datasets and want to see the updated rows and common rows in both the tables. 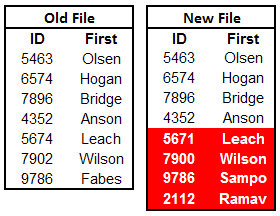 The rows that are highlighted in red are updated rows that do not exist in Old file. The EXCEPT operator returns rows from the first query that are not part of the second query. It returns updated rows that are not found in the old file. The INTERSECT operator returns common rows in both the tables. We can compare two datasets with data step merge statement. First we need to sort both the datasets by all the variables and then merge by _all_. 5 Responses to "SAS SQL : Comparing two tables"
I also want to compare two datasets but want to output those attributes for which the values are different only. so in the output i want to show that b attribute in the 1st row have different value. which wil help me to identify the pattern of wrong output and will help me to work only on those attributes for which my output is not matching with the master data. please send your suggestions as i need the solution very urgently. i am also working on that but not able to capture the erroneous attribute. Please email @pawan.pvs@gmail.com if someone finds something.